Status: Rare casual spring and fall visitor central and east. Documentation: Photograph: 16 May 1995 Lancaster Co.
Taxonomy: Thirteen subspecies are recognized, 11 from Mexico to South America, the others flammeus of southern California and southern Nevada to southwest Texas, and mexicanus of southwest Texas and northern Mexico (Pyle 1997). 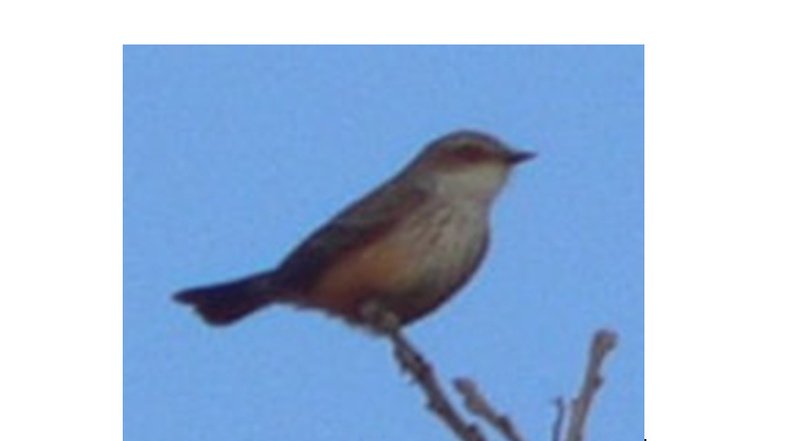 Pyle (1997) stated that flammeus is a vagrant to Nebraska; Ellison et al (2009) noted that mexicanus has occurred as far north and east as Ontario. Spring: There are five reports, three documented and the others likely correct; all are listed here. 29 Jun 1980, a pair seen by veteran out-of-state birders at the Valentine Fish Hatchery, Cherry Co (Loren and Babs Padelford, pers. comm.). Fall: There are four reports, including one accepted by NOURC; all are in late fall, 25 Oct-11 Dec, and all probably correct. 11 Dec 1954, an immature male that had been present on the grounds of the University of Nebraska Agricultural Experiment Station near North Platte since Oct was collected (Rapp et al 1958, Bray et al 1986). The specimen was mounted and deposited at the Hastings Municipal Museum, where it was observed by Burton Nelson, but the specimen cannot now be located (Bray et al 1986). Comments: Vermilion Flycatcher has a tendency for wandering northward on the western Great Plains, usually early in spring and late in fall, but there are several mid-summer records. There are 45 records for Colorado (CBRC 2018) and 17 for Kansas, where it nested in 2006 in Morton Co (Thompson et al 2011). There are four records for Wyoming, three of which may have been the same individual (Faulkner 2010), three for South Dakota (Tallman et al 2002), and seven for Iowa (IOU 2018). Photograph (top) of a Vermilion Flycatcher at Buffalo County Lake, Buffalo Co 11 Apr 2018 by William Flack. Colorado Bird Records Committee [CBRC]. 2018. Vermillion Flycatcher records. Colorado Bird Records Committee database, accessed 18 February 2018. Iowa Ornithologists’ Union [IOU]. 2018. Vermillion Flycatcher records. Iowa Records Committee reports of Iowa rare bird records, accessed 30 April 2018. Viehmeyer, G. 1961. Excerpts from letters. NBR 29: 23. Williams, F. 1976. Southern Great Plains Region. American Birds 30: 858-862.